Police say CCTV cameras have captured 65 vehicles being driven down a one way street in Flintshire in the wrong direction. Holywell High Street is ‘No Entry’ from the top end near the Victoria Hotel, the road can only be accessed from the bottom by the ‘Talk of the Town’ takeaway. Drivers caught driving the wrong way down the one-way street face a possible fine and 3 points on their licence say police. Holywell High Street reopened to vehicles on Wednesday after Councillors agreed to de-pedestrianise the towns main shopping street. The High Street was pedestrianised in the 1990s and, since that date, there has been much discussion locally on the value and impact of the ‘traffic free’ status on businesses and footfall. A six-month trial last year saw a temporary traffic order introduced allowing vehicles back onto the High Street. 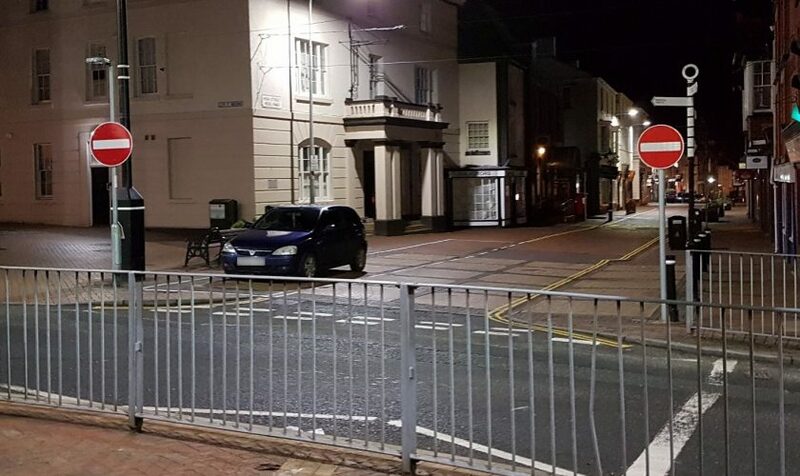 The pilot was deemed a success with Flintshire Council, Holywell Town Council and all businesses supporting a long-term move to a permanent de-pedestrianised state, however following the trial, the pedestrian-only zone was reintroduced. The High Street reopened on Wednesday for a further period of three months while the councils seek £800,000 funding from The Welsh Government to keep the road permanently open.